GNHAAHS Co-president Diane Petaway, Dr. David Canton, and Carolyn Baker. Leah Andelsmith Photos. 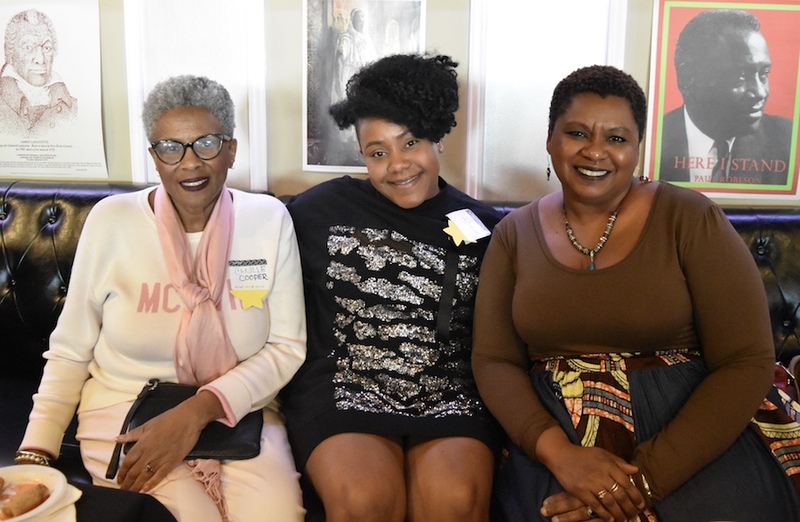 A historical celebration of became a call to action Saturday night, looking to the past to inform Connecticut’s future—and the way its students learn about African-American history in the classroom. 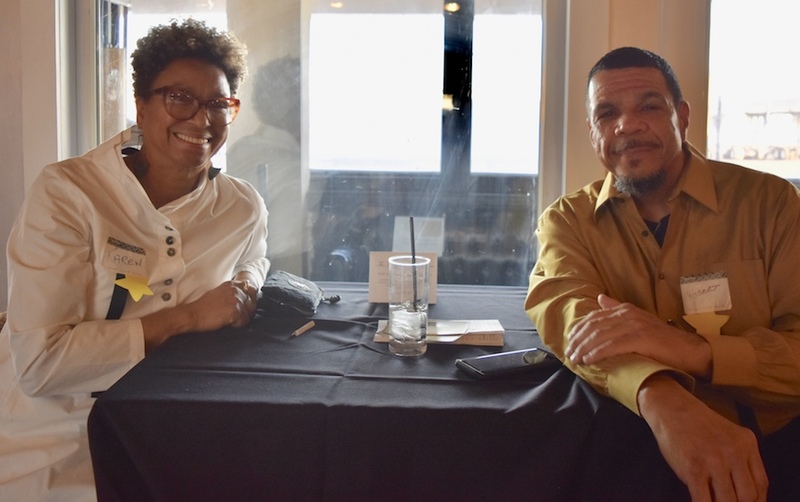 That message came from the Greater New Haven African-American Historical Society (GNHAAHS) last weekend, during its Quadricentennial Day Party at Terminal 110 Restaurant and Lounge in New Haven’s Long Wharf neighborhood. Held Saturday afternoon and themed “Resistance, Resolve, Redemption,” the party brought in around 30 people from around both the city and the state. The quadricentennial recognizes that day in “the latter end of August” 1619, that “20 and odd Negros” were brought against their will to Point Comfort, Virginia and “bought for victuals” by the colonists there. It was the first recorded arrival of enslaved Africans to the British American colonies—colonies that would eventually become the United States—and for many, it will be an opportunity not to celebrate the institution of slavery, but to honor the contributions of African-Americans in the founding and development of the nation. Cooper and Carter-David with Roxana Walker-Canton (right), filmmaker and the owner of KIMCAN academy in Hamden. “Even though we say we celebrate Black History Month all year long, I don’t think we actually do. I hope this recognition will spark that focus, not just with the historical society, but with the wider community," said Walker-Canton. 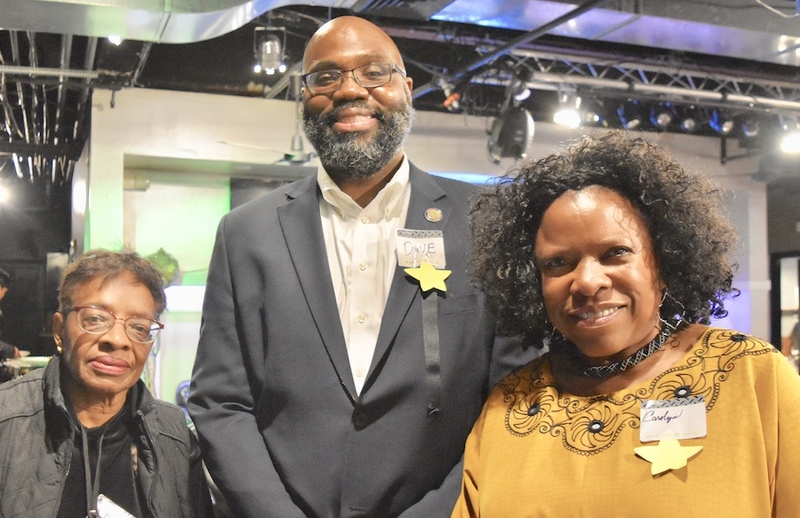 "We certainly wanted to take the opportunity to commemorate and honor those people who were able to survive such an experience—and endure—so that it’s never forgotten,” said GNHAAHS Co-president Carolyn Baker said in a recent phone interview. GNHAAHS was founded in 2003, shortly after the Connecticut Afro-American Historical Society was closed. Following their incorporation in 2004, GNHAAHS was asked to join Southern Connecticut State University’s Ethnic Heritage Center, which also includes Irish, Italian, Jewish, and Ukrainian historical societies. 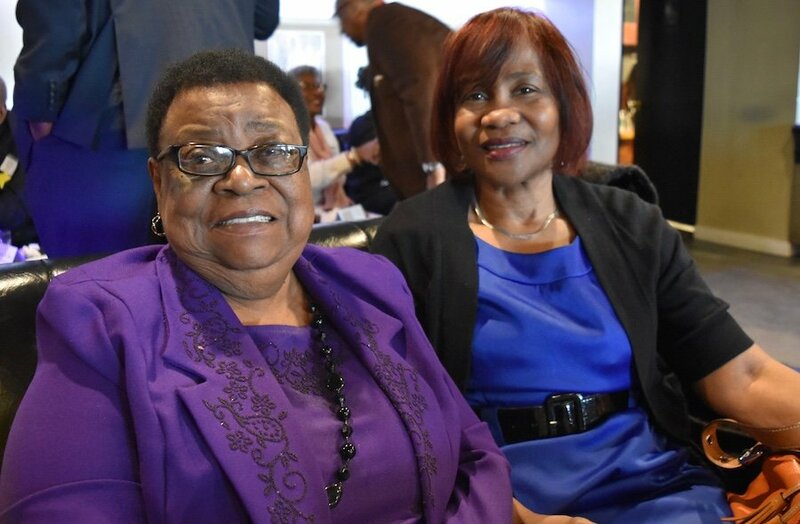 The society maintains an archive of African-American history, hosts educational and social events, and honors community elders who have worked to impact the community with lifetime achievement awards. Baker said that the party was not the only event planned for this quadricentennial year; the historical society is already organizing a lecture series and a film festival. “We are presenting the idea to let people know that it’s something that we need to think about and develop programming around, but we’re presenting it in a softer way for this first time,” she said. Dori Dumas, Renee Hoff, Karen Dubois-Walton. Baker said that David Canton, associate professor of history and director of the Africana studies program at Connecticut College, has been instrumental in sparking the historical society’s interest in recognizing the quadricentennial. The Bronx native joined the GNHAAHS board of directors just a few months ago and says he hopes to attract young people to events this year. But the society’s view is that its role in African-American history is as much about the present as it is the past. Saturday afternoon’s party also included a discussion on a bill that has been proposed by State Rep. Bobby G. Gibson of Bloomfield. HB 5009, an act concerning the inclusion of African-American studies in the public school curriculum, would make it mandatory to teach African-American studies as a part K-12 social studies and history curricula—an issue which dovetailed with the event’s focus on honoring the contributions of African-Americans. Bridgeport schools have already enacted such a requirement. “It’s not that it’s not offered in the schools, but it is offered as an elective,” Baker clarified, pointing out that electives can be hard for students to fit into a rigorous schedule and are often weighted less than required courses, which can be a turn off for high-achieving students concerned about their class rank. Karen Saint-John, left. Robert Pimentel, right. The couple said the quadricentennial is an event they’d like to support. "It’s not a history to be ashamed of and it’s not a history to run from, but we came here against our will and we helped put this country together,” Gibson said at the event. He added that it’s about more than just learning about Dr. Martin Luther King Jr. or knowing who invented to stoplight or worked with the peanut. He hopes that the effects of the bill will be much deeper. “This could change the lives of our kids. They can study and know their background and heritage. It’s not just for our black kids,” he said. “Everyone needs to know” in order to promote understanding and cooperation. Mary Morrison, left. Janie Johnson, right. Johnson said she likes how GNHAAHS is changing the community and she wants her grandson to know the history of African Americans in New Haven. Despite the social issues at hand, the afternoon had a festive vibe, with a friendly, intimate crowd of about 30. Groups of three and four chatted around the room, enjoying snacks and networking with new and old friends. 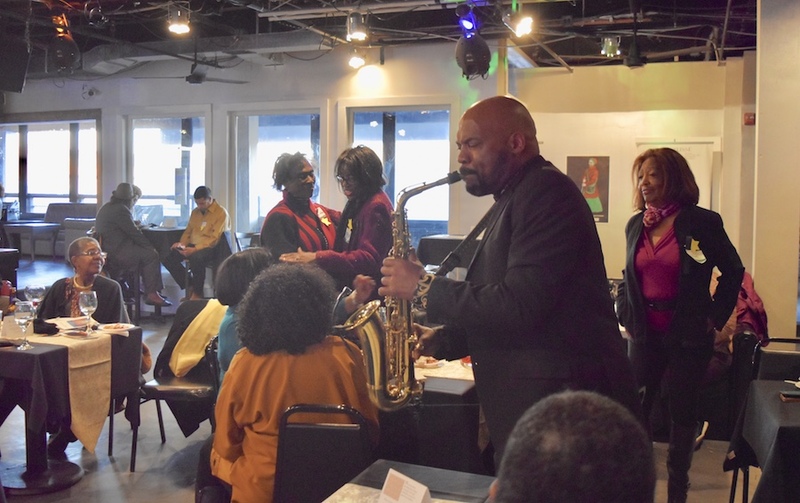 Saxophonist Fred Nobles Jr and his band played several sets of crowd-pleasing jazz and R & B, with Nobles even wandering off the stage and into the audience to take his passionate solos. Monk-Adams said that the classic song “had no resonance” for her—until she changed the words to reconcile both her present worries and a troubled history. “It always gave me the image of ‘them’ sitting on the porch with a mint julep, but ‘we’ are in the fields. So, who’s really living easy?” she said during a chat between songs. Fred Nobles Jr. walked out into the audience for a sax solo. 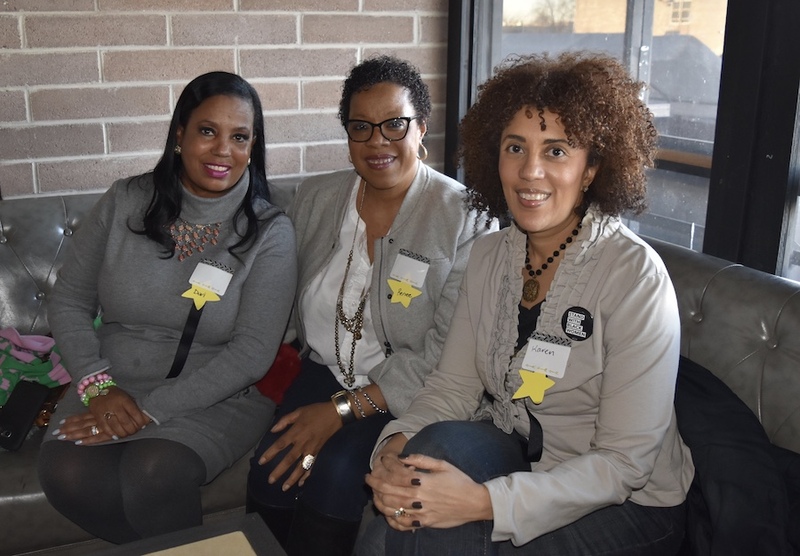 The event drew leaders and members of many African-American organizations in New Haven. Karen DuBois-Walton, social action chair for the local chapter of the Delta Sigma Theta Sorority, said that the group also has its finger on the pulse of HB 5009. They’re hoping for a favorable vote in the education committee so that the bill will come before the full assembly for a final vote. “It’s important for people to recognize that there is a lot of support around it, and support across all counties. It’s not just an urban issue. It’s American history that should be taught in all classrooms,” she said. Greater New Haven NAACP President Dori Dumas agreed. “It’s painful to know the history, but you still should know it,” she said, adding that the NAACP has been fighting for HB 5009 for years. Dumas also said that she wanted to learn more about the quadricentennial since her organization is also planning activities for it this year. On a couch closer to the band, NAACP Chair of Education Camille Cooper expressed her hopes for the quadricentennial. “What I would like is for young people to understand history beyond just individuals. There needs to be a deeper understanding of the flow of history and the different periods,” she said, listing the Middle Passage, Reconstruction, the Jim Crow era, and the Great Migration as examples. SCSU is hosting the 1619 Lecture Series with three more dates scheduled this spring, and a conference is in the works for October. “We didn’t want this to be overlooked. If we don’t commemorate it now, we’ll miss the opportunity,” said Carter-David. As Canton and other organizers called on sororities and fraternities, churches, community groups and civic organizations to join in the commemoration of the quadricentennial and the support of HB 5009, what was immediately apparent is that there is a network of Black organizations in Greater New Haven supporting each other and coming together on these issues.